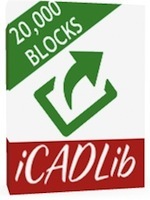 The iCADLib module also allows you to add and categorize you existing block library. Its easy to use and allows for quick block retrieval and insertion. iCADLib delivers electronically. A CD backup can also be purchased if needed and delivers 3-5 day Priority U.S. Mail.